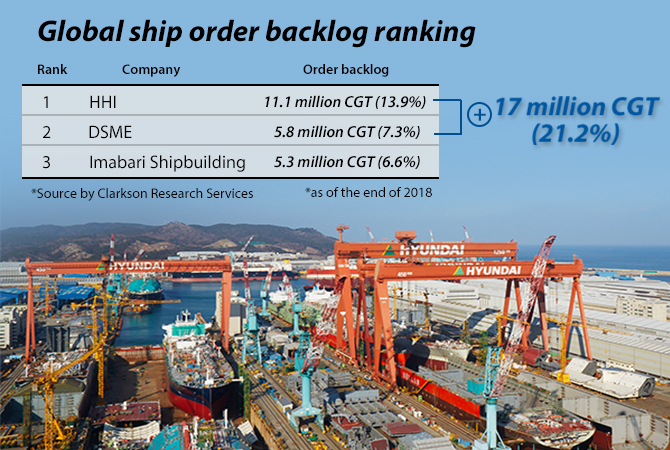 Daewoo Shipbuilding & Marine Engineering (DSME) will formerly go under its bigger local rival Hyundai Heavy Industries Group (HHI) under government-led reorganization scheme on the shipbuilding industry grappling with the ascension of Chinese competition and weakened competitiveness to create a behemoth unmatched in shipbuilding capacity and size. 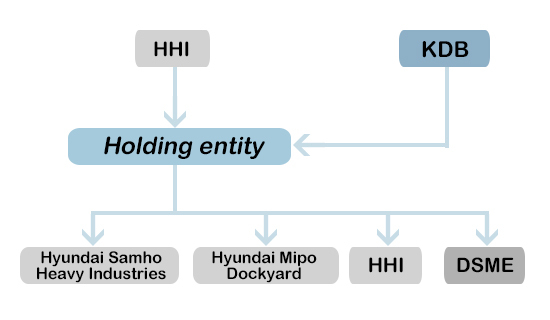 State-run Korea Development Bank (KDB), major creditor of DSME, announced Tuesday that it has signed a memorandum of understanding with HHI after Samsung Heavy Industries passed up the offer. The final contract will be signed after the bank’s board grants final go-ahead. The board meeting is scheduled to open early next month. The KDB has been proceeding with the M&A deal with HHI since October last year. The two parties had entered into a “preliminary and conditional” deal under which the policy bank offers to hand over its entire 55.7 percent holding – or 59,748,211 shares- in DSME. The world’s biggest shipbuilding conglomerate will create a holding entity to oversee shipbuilders including the newcomer DSME. The group has Hyundai Heavy Industries, Hyundai Samho Heavy Industries, and Hyundai Mipo Dockyard under its arm. In return for the DSME shares set at 34,922 won($31.07) a piece, the holding entity will issue 1.25 trillion won in preferred shares and 6 million common shares tantamount to 7 percent stake to be assigned to KDB, making it the second shareholder after HHI with 28 percent. The holding entity would become an unrivaled giant in the shipbuilding community with as many as 23 entities under its family. According to industry-tracking Clarkson Research, HHI and its affiliated companies accounted for the largest backlog of 11.11 million compensated gross tons (CGT), or a share of 13.9 percent, as of the end of 2018. DSME came second with 5.85 million CGT or 7.3 percent. Together, they will be responsible for 21.2 percent share, more than tripling that of the world’s No. 3 Imabari Shipbuilding of Japan with a 6.6 percent share (5.3 million CGT). On Tuesday, shares of HHI fell 0.76 percent to finish at 130,500 won while those of DSME gained 0.15 percent to 33,050 won.